Your Labrador Retriever puppy, or Golden Retriever, needs the proper nutrition from its pet food that it deserves if it is to grow up as strong and healthy adult labs. 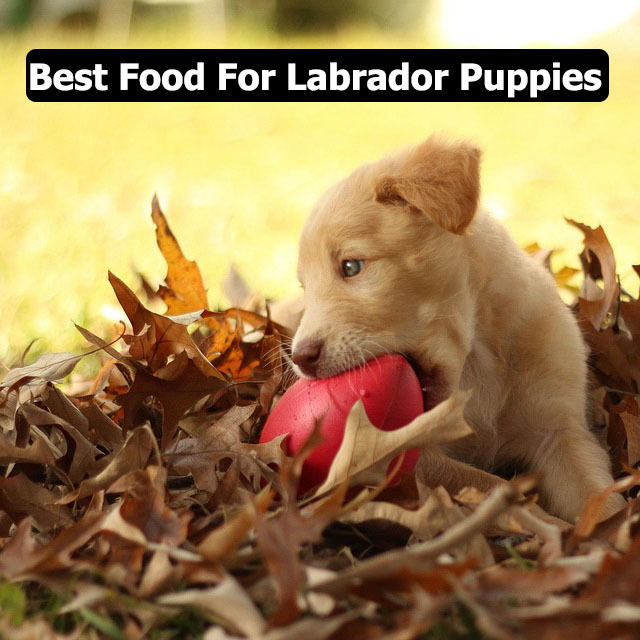 However, you should not choose just any kind of food for your Labrador Retriever puppies. You have to look carefully at the ingredients that are in the food and see how well they can handle the growth needs that your puppy has. It is all about giving your lab puppy a comfortable life while supporting a natural growth pattern. You need a quality food that is designed with large breed puppies in mind. Your dog will grow in size by quite a bit over the first few months of its life. 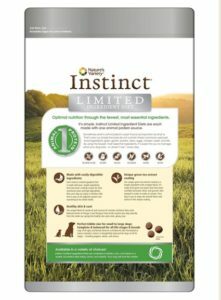 Your dog’s nutritional needs are clearly going to be different from that of what other dogs have. 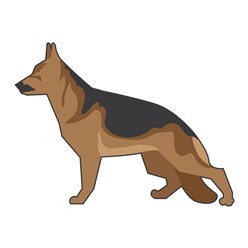 It is still important to watch for what you are adding kibble (dry dog food) pet food into your dog’s diet for high-quality protein and many other benefits. You must look carefully so you can find something that is appealing and easy for your Labradors to consume without problems. This can really make a difference when handled right and with enough care. First, it helps to stick with giving your Labradors’ dry food. While it is true that wet food is easy for a dog to digest, you should at least provide your puppy with plenty of dry food. The dog’s teeth and jaw line can develop while chewing dry food. The pressure needed to get the dry food processed will help to make it easier for your dog to enjoy a good meal. Also, your dog’s teeth will be easier to clean while eating dry food. In addition, dry foods are often designed with care and contain more of the necessary nutrients that your retrievers need. Dry food is designed carefully and with a better attention to detail. With this in mind, the foods you will read about here are all dry foods. 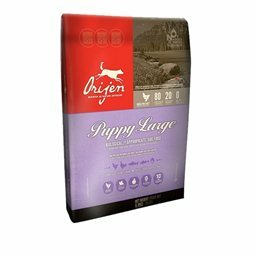 They are easy to feed to your dog and will ensure that your lab puppy can grow and develop the right way. DHA should especially be considered when finding something attractive and worth having. This is a great ingredient that helps your dog with developing a healthy neurological system. This is found in many fish-based ingredients and promotes the development of nerve cells. 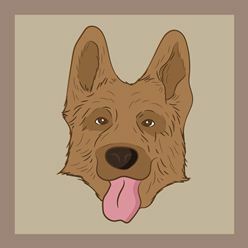 This in turn improves upon how a dog’s brain functions are formed and can make it easier for the dog to stay active and functional. You have to look for foods that contain glucosamine and chondroitin if possible. These are products that help with restoring joints and with keeping them flexible. These are typically associated with senior dog foods especially with so many ingredients helping to relieve joint pains. But they can also work well for lab puppies. As your puppy grows, your dog will start to grow into one’s joints quite well. It is a necessity to offer glucosamine and chondroitin into your dog’s joints so it will be easier for your retrievers to develop and stay healthy. This is also to keep mobility problems from being a threat. After all, it does not take much time for your dog to really grow in size. The first option is this grain-free formula. It is made with chicken and turkey and offers a strong amount of protein. About a third of this dog food is made with chicken protein. This also contains a number of necessary nutrients like vitamins D and E to improve upon your dog’s bones and immune system. Various vegetables like broccoli and carrots are also included. One appealing part of this product is that it contains green tea and rosemary extracts. These assist in improving upon how your dog’s immune system forms and can keep infections from being a threat. Another dry food option, this comes with chicken ingredients. It starts with deboned chicken and then moves on to dehydrated chicken and finally to chicken liver. All of these are made with great iron stores and healthy proteins. 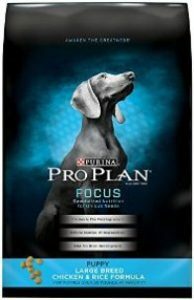 These give your dog energy and support for building great muscle mass. Turkey and fish ingredients can be found in this food too. 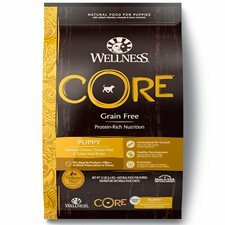 Glucosamine and chondroitin are also added in this dry food. These help to produce healthy joints so your puppy can grow into them right without feeling pains or other common issues around them. 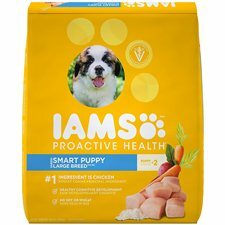 There are no fillers or soy ingredients in this option from Iams. It contains omega-3 fatty acids to improve blood flow and circulation. DHA is added to promote healthy brain development. Antioxidants are also added to create a better product that is comfortable and easy to consume. Real chicken is a key part of this food. It is made with actual deboned chicken without any byproducts added. The crude protein is about twice as much as the crude fat that is provided in this recipe. This is all made with up to 10% moisture. This ensures that the food can easily break down without being too rough or hard to consume. Purina makes a number of its foods for many types of dogs and this particular option is made with large breed puppies like lab puppies in mind. It offers real chicken as its primary ingredient. DHA is also included from fish sources to promote healthy brain development. Healthy antioxidants are also added to help with promoting a strong immune system. These are added in the food to give a puppy more control over how infections and allergic reactions are controlled. The best food for lab puppies will be something made with a comfortable body that is easy to handle. Make sure when looking at what you are feeding your lab puppy that you are finding something that is comfortable and easy for your dog to consume. You might be surprised at how well different types of foods can work for your dog’s needs.